Main Street Gazette: Happy Holidays to you, and you, and you! I’m getting my holiday greetings out early this year, after all Christmas Cards are already filling store shelves, and nothing says Christmas like three weeks before Halloween! Also my wedding is a little over two weeks away, and apparently I am supposed to be spending more time on seating arrangements, play lists, and putting together gift baskets than I am digging deep into Disney details. 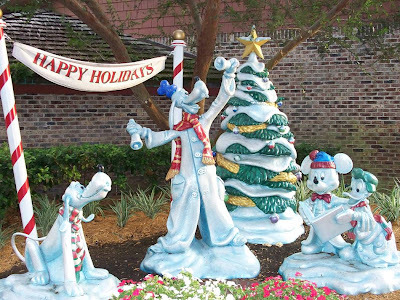 These hip holiday snowmen, or rather snow-mouse, -dogs, and -duck, look like something straight out of Blizzard Beach. Surprisingly, they are actually residents of Downtown Disney Marketplace. Behind Wolfgang Puck Express and Disney’s Days of Christmas, heading towards the resort bus stop, these guys hang out year round giving guests the opportunity to prepare their Christmas cards months in advance.